Ready, Set, Go! This sports themed combo features an inflatable basketball, football, soccer ball, and baseball on the 4 corners. Activities include a jumping area, slide and climbing area. 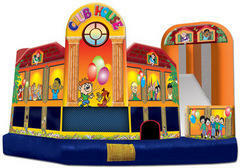 This 5 in 1 Clubhouse combo is the ultimate inflatable. The large interior features a jumping area, basketball hoop, climbing wall and slide, as well as both log and popup obstacles. 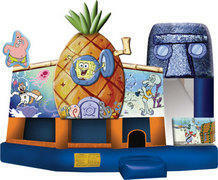 This 5 in 1 Spongebob combo is the ultimate in inflatable jumpers. The large interior features a large jumping area, basketball hoop, climbing wall and slide as well as both log and popup obstacles.